I’m just coming back from a very successful trip to my lys, which means it’s Ramen for the rest of the month here. But it’ll be so worth it. I just found the most beautiful, soft, organic Merino wool ever. I’m so excited about it – and I haven’t even gotten it on the needles yet! It’s called “Cheeky Merino Joy” by Rosie Green Wool. Well, I’m definitely feeling the joy! I chose the color “Deep Ocean”, a dark shade of blue that is almost black. Actually, at mylys (that is the name of my lys here in Hamburg) it was difficult to distinguish the blue and black skeins in the artificial lighting. It’s definitely a deep, rich, inky blue in daylight. What really has me gushing here, and what got me hooked at the store, though, is the incredibly soft hand of the wool. Yummy, like buttah…or cashmere! Wish I could just reach through the screen to let you pet it yourself, right now. To top it off, the yarn is organic, certified according to the GOTS. I am not very well informed about organic methods and standards, mostly because I’ve given up on figuring out the (what seems to me) chaos of labels and standards and marketing schemes, but here I’m feeling confident that the wool is ethically and mindfully produced. Have a look yourself at Rosy Green Wool’s website, They explain their processes thoroughly and give background info; I learned a lot. 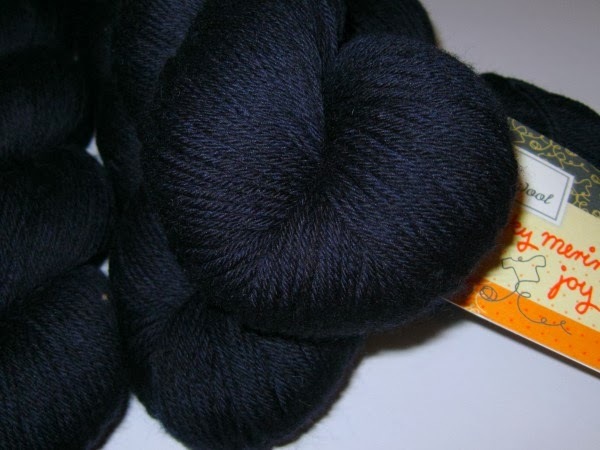 So, please do me a favor and get yourself some Rosie Green Wool, preferably at mylys (they have an online shop, too). They are both businesses I would love to see thrive and be around for a long time :). PS: It’s Ramen here not because of the cost of the yarn, which is perfectly reasonable, but because of my undisciplined spending behavior in yarn shops in general. I got 5 skeins, ahem.